and most importantly the timing of all these events. Also, I have a lot of creative ideas that can enhance any special occasion. Your event is important! You should not have to worry about whether the DJ will do a good and complete job. I will, because I care. I take my job as DJ very seriously, and I always strive to put on the very best show possible. Futhermore, I offer a optional "Special Effects" light show that is far beyond what most mobile DJs can provide. No cheesy color wheels, or weak strobes for this DJ. My lighting & sound system are "Top-Of-The-Line" and State-Of-The-Art!!! As is the case with any good light show, Fog machines accent & enhance the visual effects of the lights. Therefore I use (low impact) fog machines where permitted. All my lights make for a very impressive & unusual "Special Effects" light show, that is truly SPECIAL. Another factor that sets me apart form other DJs is the fact that I do not charge by time. I offer a Flat rate, that is usually lower than what other DJs are currently charging. 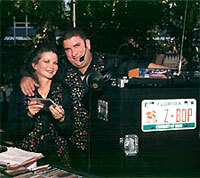 Hence the name Z-BOP Unlimited - UNLIMITED MUSIC, UNLIMITED TIME, UNLIMITED FUN!!! And who wants to watch the clock when they are having fun??? I hope you will consider me for your future festivities.